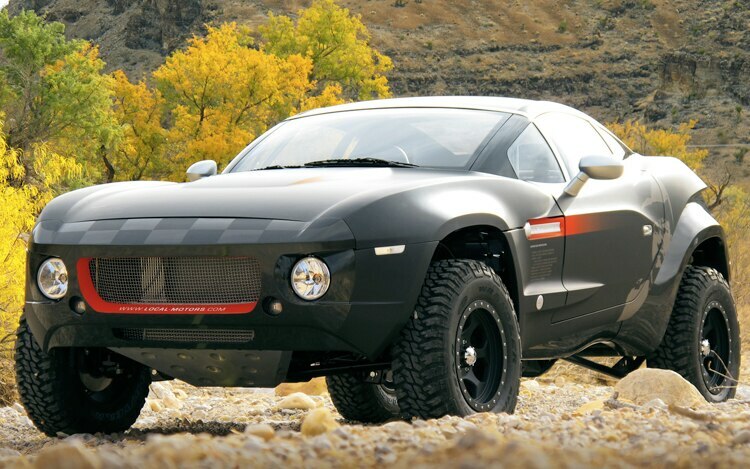 Local Motors, the Arizona-based company behind the bizarre Rally Fighter off-roader (pictured), is now at work on a totally new project to make a new platform for a pair of track-ready, lightweight sports cars in the same vein as the KTM X-Bow and the Ariel Atom. Since Local Motors is known for creating cars through an open-source collaborative process that opens up the design stage to the public, the company is welcoming input from anyone who might have a say in how this car might look or feel. Local Motors is setting some parameters for this project, though, as the company is hoping to create at least two versions of the car, one of which would be a totally stripped down car without a body just for track days, like the Ariel Atom, and one that would mount a body on this same platform to become a full-on sports coupe that’s usable on public roads. The basics of the platform are already decided: front engine, rear-wheel drive, manual transmission, independent front and rear suspension, and a four-cylinder turbocharged engine producing more than 200 hp for the base model. Local Motors is also setting a weight target for the lightweight version to be under 1600 lbs. The lightweight track toy will be developed first, as that means the mechanical components of the testing can take place while the full-bodied version is still in the works. In the statement of intent for this project, though, the company openly identifies the design challenge of engineering a platform that works equally well when naked as it does when it has a body. Like it did with the Local Motors Rally Fighter, many of this new car’s components will likely come from other existing cars, like the engine and transmission. We’re interested to see how things progress as the open-source development process for this new car starts up sometime later this year.